In their community of Millbrook First Nation, Shane and Leana Kennedy were frustrated by seeing how underused the curbside collection program was, and by the massive amounts of garbage overflowing from the local drop-off bins. They came up with a solution: their business, G-Man Waste Removal, would help clean up the community and educate their neighbours on proper waste diversion. At the core of their business is exceptional customer service. This service, in collaboration with their partners at the Mi’kmawey Green Communities Program, provides one-on-one education and assistance to the nearly 400 households in the community of Millbrook and its satellite communities in Sheet Harbour and Cole Harbour. And they have had a huge impact in their first year of business. The community is cleaner, residents care more, and G-Man has more than doubled the number of customer containers than they anticipated in their first year of business. G-Man keeps community members in the loop by writing articles in their monthly newsletter, delivering door-to-door notices, and constantly keeping everyone informed via weekly online collection reminders. Their efforts have not gone unnoticed. G-Man has been called on to perform waste audits for seven First Nation Communities across Nova Scotia to develop a baseline on diversion programs and offer recommendations for improvement. Sponsored by Scotia Recycling Ltd. Currently with a waste diversion rate of 85% in Canada, IKEA’s target is 90% by 2020 for all stores world-wide. The new Halifax store is an outstanding example of how this international corporation ensures proper waste diversion locally. Clearly labelled paper, organics, and blue bag recycling bins throughout the showrooms, restaurant, and staff rooms ensure customers and staff are able to source separate their waste. To ensure proper management of the cardboard and film plastic, the IKEA Halifax store has three cardboard compactors, and a bailer for film plastic. This ensures proper processing on-site before the waste goes to the municipal system. They also a take back program for mattresses, which they ship to Montreal for responsible recycling, and an e-waste recycling program with a 98% diversion rate! For organics, IKEA Halifax has their own on-site food waste management system that liquefies their fruit and vegetable waste through aerobic digestion. They also purchase materials from subcontractors who use upcycled materials for the production of retail items. 14 Wing Greenwood is the largest air base on the East Coast with about 2,800 employees and approximately 800 buildings and Housing Units. There are hundreds of sorting stations throughout the operation side of the base, and personnel are required to use them. 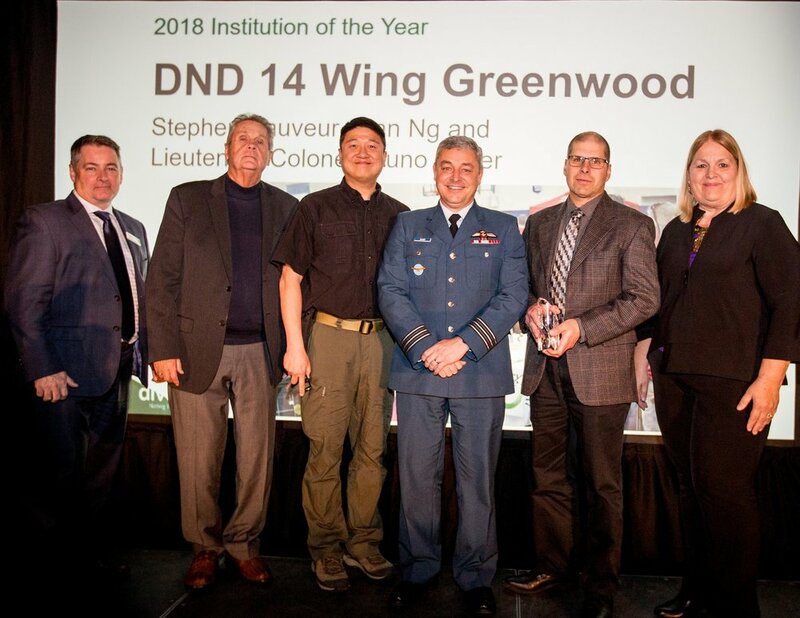 Two sections at 14 Wing Greenwood spearheaded the activities that led to this nomination – 14 Wing Environment and Real Property Operations, but, ultimately everyone on the base plays a role in the recycling and sustainability programs. Since September last year, over 70 tonnes of recyclables and organics have been diverted from landfill, and over 90 tonnes of metal, wood, and brick have been kept out of the landfill. The wood, metal, and brick are all the more impressive, because none of these materials are banned from landfill. Close to 30 of those tonnes are wood, which could have gone to a construction and demolition site and been buried – but instead they are destined for electricity generation. All told, 14 Wing diverted more than 165 tonnes of material in the last year. Kate is a zero-waste champion. 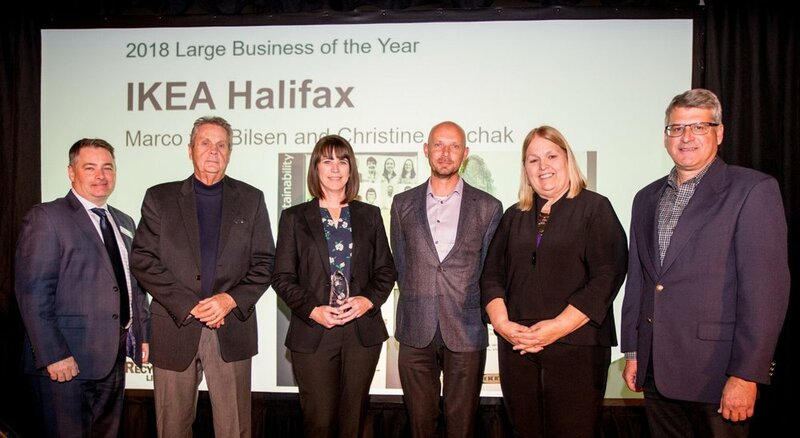 She started and runs OurPositivePlanet.com, a website that shares environmental success stories, and founded a zero-waste coffee shop, bulk store, and community space called The Tare Shop in the north end of Halifax—a first of its kind in our province. Kate brought this unique concept to the forefront. Many people talked about doing something like this for a long time, but Kate put the idea into action and has generated a lot off buzz and excitement in the process. Not only does Kate talk about a zero-waste lifestyle, she lives it. Starting with every day, small steps, she began using reusable bags to grocery shop, picking up garbage, refusing plastic straws with drinks, and buying products without packaging. Now, Kate carries a zero-waste kit to ensure she’s always prepared: with reusable cutlery, a water bottle, thermos, mason jar, a container and reusable cotton bags. Kate embraces the zero-waste culture, sharing her vision with the community through workshops and lectures. She provides education to help customers reduce their personal waste and invest in a sustainable lifestyle. This year’s Community Project of the Year started as a recycling initiative for old hockey sticks, originally destined for the landfill, to produce furniture and other products for sale. YACRO Social Enterprise, The Store Next Door in Yarmouth started their project in 2017 and it took off—it is currently their most successful project yet. So far, they have collaborated with three Canadian companies to secure a steady supply of sticks, and local hockey parents and the Junior A hockey teams have also come on board. Their story went viral and sticks have been coming in from across Canada and the US—even from NHL teams! This unique concept has had a real impact. It is educating and creating jobs in the community. The initiative to reuse a material that has no other use, started with a headboard that sold before it was even built, and expanded to a product line with over 35 items. They also produce custom pieces and incorporate their customer’s personal sticks to create keepsakes. To date, they have diverted over 16,000 hockey sticks from landfill. Oberland Agriscience is a Nova Scotian start-up company that upcycles organic waste into high value protein products. Oberland uses a novel waste stabilization process that transforms organic waste into a nutritious insect feed. With a two-process operation, Oberland addresses both the increasing organic waste burden, and the growing protein shortage within the Atlantic region. Oberland diverts organics from breweries, cafes, and agriculture sources. Once processed, the organic waste becomes a long-term stable food source for the voracious black soldier fly larvae. The larvae in turn become a nutrient-rich, highly sought-after, high quality protein ingredient for pet food, aquaculture and agriculture feed. Atlantic Canada's organics supply is intermittent and influenced by seasonal shifts. To overcome this, Oberland developed a proprietary methodology to stabilize organics for long-term storage without the use of chemical additives or refrigeration. This allows them to silo large volumes of processed waste when supply is plentiful, and have ongoing feed stock throughout the year. Oberland is also striving to become a zero-waste facility. The organic waste processing does not generate a leachate, and uses minimal water. The small volume of material remaining after larvae rearing has been tested and it is classified as a Class A compost. So, rather than dispose of leftover material into the waste stream, Oberland will collect the material and sell it as a soil amendment. 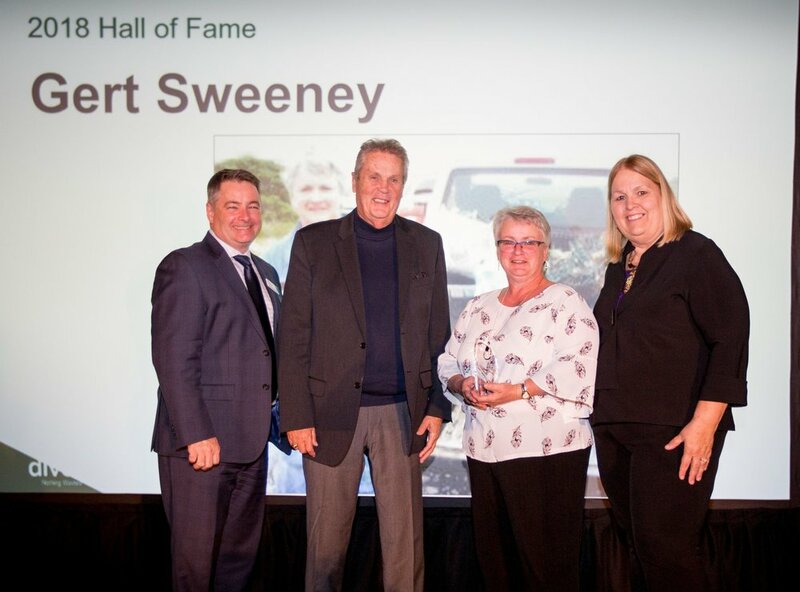 Many people fondly know her as one of the “Litter Ladies of Cape Forchu.” In the region, there is no one that can match the passion and commitment that Gert Sweeney has shown towards waste reduction over the years. Over the years, Gert has organized regular clean ups, putting notices in local mailboxes. She even analyzes the data, can relate what they are finding on the beach to changes being made on the boats and has used the information to make further improvements. She and her group also participate in the Adopt-A-Highway program, and when she saw no other highways were adopted in her area, she was instrumental in getting another group to sign up.